Does your dog growl at you when you approach his food bowl? Is your puppy possessive about toys and rawhides? Does he snap at you when you even step near him when he's got a bone? Does your dog bare her teeth when you approach the couch? If not, you're lucky! Read through this information and start working with your puppy or dog now, to keep him in the blissful state of loving your approach to his food bowl or other prized possessions. If you are seeing aggression, definitely read on to find ways to help your dog. The technical term for this behavior is Resource Guarding, and it's an absolutely normal dog behavior. However, it's not something we humans appreciate. Fortunately, resource guarding is also a behavior that we can change. Raw meaty bones are hard to share. It's usually a good idea to separate dogs before feeding bones. A dog is an animal, a specialized wolf cousin living in the human den, and not a furry little person - matter how we view him. 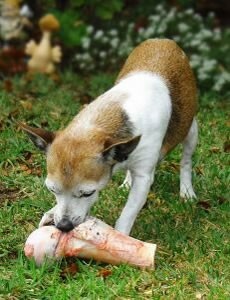 Simply because a dog lives in our home and because we view him as part of our family makes most owners think we should be able to take a bone or any other item from our dog at will. We become easily affronted if our dog decides to become possessively aggressive about his toys - even more so than if our kids become angry if we try to take their toys away! 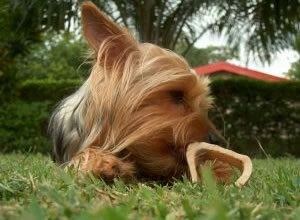 But when our dogs become aggressive about keeping hold of their bones or toys or bed, the first thing we must do is not to see the issue as one of our dog engaging in 'point scoring' with ulterior motives of longer term control of his human pack, but rather as one of safety for ourselves. If we become drawn into physical combat with our dogs over possessions, as we will see later, we are more likely to cause ourselves a great deal of problems with our dogs in our day-to-day lives together than we are to teach them not to guard their toys or bones. 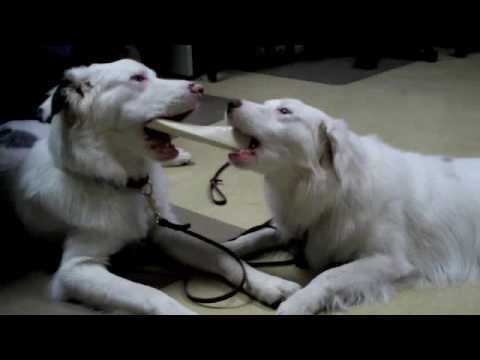 Dogs don't have to be bad about sharing bones, but they don't usually love it like this! Dogs, being predators, come programmed to guard resources that are crucial to their survival as part of their behavioral inheritance from their ancestor, the wolf. Some of those resources may be in short supply at certain times of year or in certain environments, and are therefore valuable. It is beneficial for wolves and dogs to have the propensity to look after their food and bits and pieces against other animals including, sometimes, members of your own group. For example, this is usually not true for grazing animals in terms of food - after all, what's the point of arousing yourself to look after your supply of grass when grass is everywhere? It's a huge mistake to label a dog with a resource guarding problem as 'dominant'. This is largely because it is just too simplistic to think that everything a dog might do which his owners disapprove of is some kind of a bid for power, especially if it involves threat behavior. This label can also encourage owners to look for opportunities to score points back on their dog when their time would be much better spent looking for opportunities to teach the dog not to guard his possessions and to reward him for doing other things. Here are a few of the myths about resource guarding, according to Jean Donaldson's book "Mine! 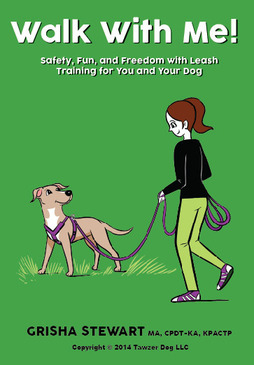 A Guide to Resource Guarding in Dogs." Myth #1: Resource guarding is abnormal behavior. Myth #2: Because resource guarding is driven largely by genetics, it can’t be changed. Myth #3: Resource guarding can be cured by making a dog realize that resources are abundant. Myth #5: Resource guarding is the result of “spoiling” a dog. So if the answer is not to "dominate" your dog or shower it with freely available food, then what is it? Simple. 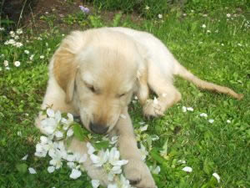 Make your puppy or dog understand that the approach of a human to his food, toys, space, etc. is a Good Thing. The process is called classical conditioning. Just as the clicker is associated with treats in your dog's mind, the approach of a human hand, face, or other body part to his food dish should mean better food is on it's way. Initiate the Say Please Protocol with your dog. There are two reasons to do this. One is to inform your dog that you and your family are the source of All Good Things, and only by being polite does your dog get them from you. The second reason is for all family members to practice training with your dog, so that he listens to everyone in the family. This may or may not help with resource guarding, but it's not a bad perk! If certain members of your family are being guarded against (growled or lunged at), then those people are the ones who should be asking the dog to Say Please more often. Teach your dog the cue GIVE or TRADE. Start with objects that he does not value as much and treats that are highly valued. Then gradually work your way up to objects that he cares very much about. Ask for him to give the object, then either wait for him to do so (if he knows the cue) or cause him to do so by presenting food near his mouth. Reward and praise him for dropping the object, then give it back to him as soon as he's done chewing. Practicing this cue, giving the resource back each time, helps the dog understand that giving away his resources to a human is a good thing, so there's no reason to guard them. Children should only work on this step under adult supervision. Start with the family member that the dog trusts most (growls at least). Teach your dog the OFF cue. If he is guarding the furniture, teach him to jump off of it on cue. Get him up on the couch by patting on it or luring him with a treat. Don't give the treat yet (we want to reward for "off", not jumping on the couch). Then say "off" and lure him back onto the floor. If you use a clicker, click as soon as he heads off the couch. Give him the treat. Don't start to teach off when your dog is all settled down on the couch. Work up to that level. 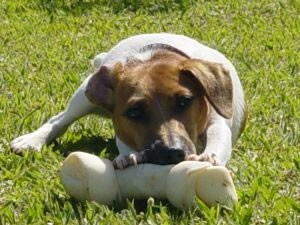 Condition your dog to expect good things when you approach him, especially if he has some sort of highly prized resource, like a bone. As with "give", start with something your dog does not guard. Walk over, present the treat while he's enjoying his low value toy or food, and leave. Do this with several low value toys throughout the day. Repeat this for several days until he begins to look up at you, with a "Hey, she's here to give me a treat" expression on his face. With the low value objects, move up to touching the dog in some way, grabbing the object (often saying "give" first), then popping a high value treat in his mouth and returning the object. Over a period of weeks or more, gradually move up to repeating the above with higher and higher value toys or food. With high value toys/food/bones, start by just walking by the puppy, out of the range that makes him growl, and dropping a treat. Move closer as the days go by, if the dog is ready; never progress faster than your dog is happily willing to go. If the dog is not relaxed and happy at any stage, you have moved too fast. Retreat to the previous level. Repeat this entire process with several high value objects. After that, progress to doing this process with more people around, more stress in the environment. Children should only work on the conditioning step under adult supervision. Keep your dog from exhibiting resource guarding behavior by not moving past his acceptance level. If he growls when you get within three feet of his toy, then don't make him growl -- stay more than three feet away from his toy next time. Better yet, remove the toys that he guards from the living area, so that he can't accidentally be triggered. If your dog guards his dinner, make sure no one approaches or give him his dinner in a separate room, for now. If your puppy guards the couch, try to keep him off of it by not inviting him up and/or by making it uncomfortable to lay on (an upside-down carpet protector works well for that). Any approaches that you make to your dog at this time while he has a resource should be on purpose and accompanied by a treat. Do NOT punish him for growling by scruff shaking or any other show of violence. All you will be doing is proving to your dog that he was right -- humans are crazy and you've got to protect yourself from them! Maintenance. After your dog or puppy is happily accepting any human approach to his food or toys (a state that humans call 'normal' and dogs call 'strange'), you are at the maintenance stage. Twice a week, at first, then once or twice per month, approach him while he's eating, pick up the bowl, and plop in a handful of treats before setting it back down. Do the same with toys or bones as well. Occasionally practice the "give" cue, replacing the surrendered object with something else if you really must take it away. Finally, continue the Say Please Protocol for the rest of the dog's life, incorporating new tricks as your dog learns them. Oh no, he's doing it again! If your dog ever starts up again with resource guarding, it's not because he is trying to take over the world. It's probably because you haven't kept up on his training and he has started to notice that it's not such a good thing to give up his resources, after all. Remind him that humans are the source of all good things by going through the above process again. Update: I got a great note from a person who read this article, and I'd like to share it with you. I just wanted to thank you for making your very helpful advice publicly available. Although I don't have a dog, my officemate is watching his in-law's dog for a while, and this is the third day Ollie has had to spend camped out in our small office. He's mostly well-behaved, but has been growling at me if I accidentally get between him and his toy or wake him up by nudging him out of my way in his sleep -- he's 100lbs and keeps laying down right next to my desk! Anyways, my officemate's been trying to be the "alpha dog" by grabbing his snout and yelling at him when he growls, but that's only resulted in more and more growling (of course). This morning I found your page on Resource Guarding and convinced my officemate to cool it with his aggressive method and try the tips outlined in the article instead. After removing his toys, and only a few hours of giving Ollie a piece of kibble every time I have to step over or move him, he's not growling at all. This sure has made our office a more peaceful place! No guarantee is stated or implied in this article and if you follow any of the advice in it, you do so at your own risk. If you ever feel that you, your dog, or others are at risk because of your dog, please seek the services of a professional dog trainer. 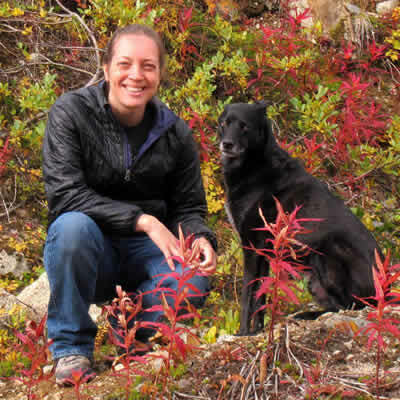 Great information, it’s so true – guarding is a natural and normal behavior, and the only way to overcome it is to understand why it happens and avoid giving your dog a chance to feel that insecurity. I have a rescue dog that I have had for 5 years. She had a hard life before I adopted her which was at an estimated age of 1. For the first 3 yrs she played well with other dogs of all kinds and never guarded food. About a year after my husband’s dog was introduced to her she started getting aggressive with other dogs other than her “sister” not triggered by anything but their presence. (No food not playing with her sister). Is this a behavior that can be changed at this point? This article does not tell me how to handle a dog that snarls and bites when you try to get something from her that it not hers. She has no issues with aggression when it comes to her food or bones. Just when its not hers.